Envato Elements is a new free plugin that offers a long list of templates for many website niches, made by Envato, the company behind the ThemeForest marketplace. In case you missed it, Envato, the company behind the leading theme marketplace ThemeForest, developed a new free plugin called Elements. Envato Elements offers over 350 unique Elementor templates for multiple website niches. The long list of templates can be used to create stunning pages right from your WordPress dashboard. The templates displayed on Elements are conveniently arranged according to categories. You can browse through the list to find your niche, from restaurants, gyms, to video production and so on. If you are looking to integrate the kind of WordPress landing page and website templates you can find in ThemeForest, Elements can be your solution. Clicking on a certain template will let you preview it before adding it to a page in your website. You will notice that each template comes included with all the relevant parts and relevant sections you can expect to find for the specific category chosen. 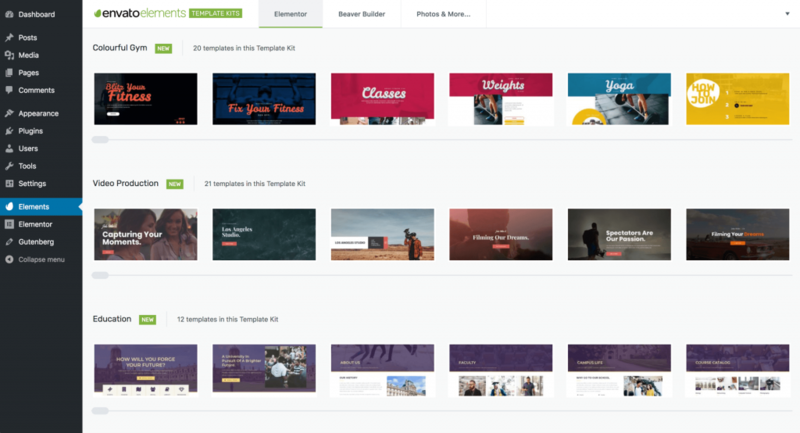 Envato stated it has plans to keep updating the library of templates on a continuous basis with new fresh material, so you can expect to see more templates and more categories accumulating Elements grows. In terms of Elements ability to work with Elementor, each template can be imported into your individual Elementor template library. The template would then appear under the ‘My Templates’ dashboard. Alternatively, Elements allows its users to create a live page. Once you hit ‘create new page’, you will get a link pointing to a draft that will be ready to publish. It’s that simple! As noted above, each template is consistent in its look and feel to the other templates of its category. This comes in handy when you want to use more than one template on the same site. You can take your pick choosing any one of the template set, and there is no need to worry about ending up with a different style for each page. The fact that Envato is the company behind this project means a lot. 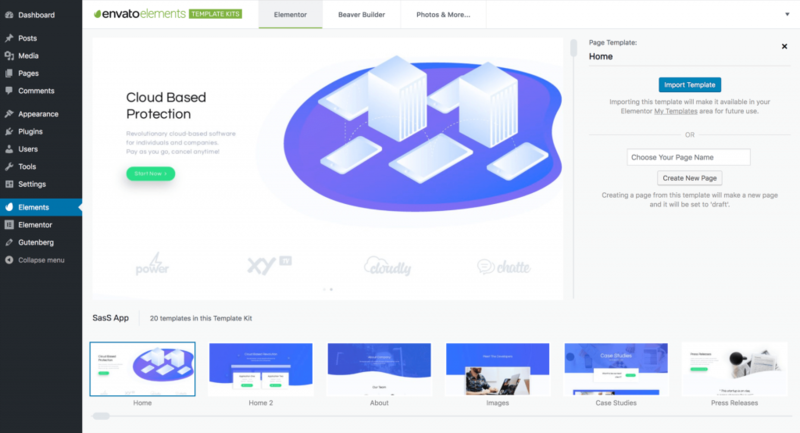 By harnessing the thousands of talented designers from ThemeForest, Envato is in the unique position to create a truly unlimited and versatile template resource. Each template is strictly scrutinized by the Envato team, all in order to provide its users with this valuable tool. We are honored that Envato decided to invest so much time and energy to develop this solution for Elementor users, and we believe it has the potential to become a great driving force for the entire theme market. Last but not least, I loved the fact that this is a free and open source project. Elements is the first project by Envato available in the WordPress repository. This is a wonderful way to begin what I hope will be a stepping stone for further involvement of Envato in WordPress. Now, while the current templates in Elements include only free Elementor widgets, Envato intends to add new templates featuring Pro widgets real soon, so keep your eyes opened for this. Sounds awesome, right? download the plugin here and try it out yourself! And don’t forget to share your experience in the comments below. We have a lot more where that came from! Join 583,560 subscribers who stay ahead of the pack. Great, indeed. Things are moving in the right direction. you should work on pagespeed! I have tried to use the Yoga template , I save in my templates, then use elementor to edit the pages, however I am unable to edit anything ? The edit panel on left is blank ? Has anyone else had this happen ? Thanks for the wonderful news! Really it makes all users very happy! Cool! Stunning! Thanks Elemntor and Envato for this great cooperation! Anyone serious about the fine print (T&Cs) you may like to take a couple of minutes and read that fine print… Not allowed to claim copyright of a site if used a template, even if you modify the template!! Arg enough for me to design my own instead of going down that rabit hole. Of course you cannot claim copyright to a template you did not design and code. Even if you modify it it does not make it yours. You can copyright the contents of the website. For example your images and your words. Perhaps you would like to copyright WordPress code? Tell if i am wrong, but have u seen such terms in WP plugins & themes in wordpress.org ? Envato has serious website issue and locked me out of my Envato account every time I tried to check out. I emailed them to close the account and they extended the subscription. Hi Max, we are currently recommending the PHP 7 or higher. Kindly view the Requirements and ask your hosting provider to upgrade it. Real web designers do not use templates. Good point, Bob but they can be a great starting point and, also, something to show clients before starting to build. They are a great ideas generator and can be adapted to suit in most cases. Amazing! Just installed it and looking forward testing it. Thanks Ben. The idea is cool, but I take the position of creating my own model, rather, it creates value in the final work, which is not only the design but several factors that involve design such as color search, conversations, meetings, phone calls, images, original photos, texts, keywords and everything that involves the design of a web site. How can I put value into something ready? This my client can do. I chose Elementor because of that !!! Putting models ready, can help designers that are starting and this is good, but if the designer wants to grow and add value, like me, it is necessary to study and study a lot … spend time and money on equipment, training, lectures … uff started a year with Elementor charging $ 30.00 per month to create and maintain a website, today I charge $ 200.00 which for my region, northeastern Brazil, is an extraordinary value! I hope I have helped, because I see my profession as unique and love what I do, but it is necessary to value and much something so precious and that is falling due to the ease of technology. Sorry for the long text, I do not know how to speak English and I use google translator. This is GREAT!!!! So happy to see this! Also, Ben do you know when Elementor is going to incorporate global styling in Elementor (colors, fonts etc) and those styles applicable in elements, templates, pages etc? Brizy page builder offers this and is SUCH a time saver. (https://vimeo.com/255728375) Update one color and it updates everywhere on the entire site! This is a MUST for Elementor! Thanks! I only recently started using elementor, and it’s the best tool I’ve ever used, this seems like another great reason to keep using elementor! This is a very promising tool. Sure it’s always better to craft your own designs, but that can be a great source of inspiration, or I could see myself using it for live wireframes. Also, for those that want to get started in freelancing, it can definitely help! Going to test it right now. Thank you very much Elementor !!! Whoa! I knew about envato elements, but didn’t know that they created a plugin before, worth to try I guess, thanks Ben! This is indeed a great news guys.i have been looking for some free templates to use with elementor. But looking at 350+ templates would take a long time. The 350+ templates are free. A subscription to the rest of Envato costs $200/year. So, good to have, but too time consuming to use. One more comment. The Envato.com site is a hard to use, distracting mess. Each screen has only a few sentences. The user must scroll down again and again to read the next bit. Sometimes text appears one letter at time, so the reader must wait. Things move and slide around. White space and images occupy far too much of each screen, allowing too little room for information. great news, and perfect timing! Is the envato elements’ themes completely reworkable in elementor? Yeah, real web designers use notepad and they code their own CMS for every project because… real web designers. Wow! it will be really helpful for my site. Going to try it very soon.